Zeta Orionis (Alnitak) is the easternmost star in Orion's belt. There are several objects in this image. 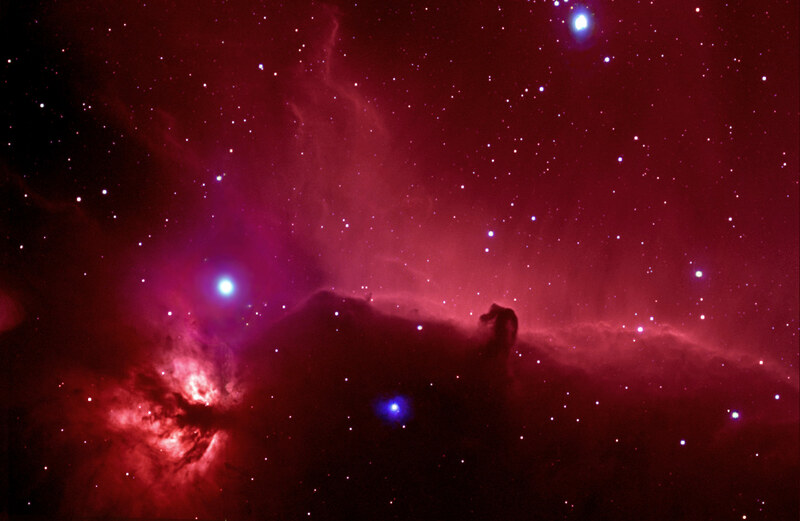 The dark nebula that forms the Horsehead itself is known as Barnard 33 (B 33). The red background is the emission nebula IC 434, the reflection nebula NGC 2023 and the emission nebula are NGC 2024 also visible. IC 434 is excited by UV light from Sigma Orionis. The dark lanes in NGC 2024 may be part of the same dark nebula that forms the Horsehead. This region is actually just part of a much larger cloud that covers most of the constellation of Orion (including the region around the Orion Nebula).